This September, Ms. Victoria Negri, an actress who has been involved with films and television, will be making her directing debut when she films "Gold Star" in Orange, Conn. The thought-provoking film stars cinematic legend and Ridgefield resident, Robert Vaughn. I asked Ms. Negri about the movie, what it's like to shoot a film so close to home, and how she felt about having The Man From U.N.C.L.E star in her film. For those who don't know, tell me about the story of "Gold Star." 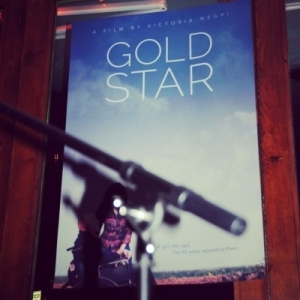 "Gold Star" is a very personal film to me. I began writing it three years ago after my father suffered a stroke in September 2011 at the age of 87, when I was only 24. It's about a father and a daughter, who have grown apart in recent years, struggling to connect and come to an understanding in his failing health. The story of writing the film is unique in that I wrote it as the events in the screenplay were happening. Some of the film is true to life, but I had to make the relationship much rockier between the characters so that the audience can watch my father and I grow. In reality, I was extremely close to my father. You'll be filming all around Orange, Conn. What has the community's response been thus far to you shooting the movie? I wouldn't be able to make this film without the support of my community. And it goes beyond just Orange, but to Connecticut overall. The Orange Ale House and Anytime Fitness have allowed us to shoot in their businesses for free. Anastasio's Restaurant in New Haven is providing catering. We held a fundraiser last year at the Ale House. And even more so, my family and friends have been extremely supportive. We're shooting many scenes in my house, my grandmother's house, my best friend in Orange, and so on. I could go on and on about so many things that have been helpful. But really, this film would not be possible without my family and community coming together to make it happen. I'm so grateful and lucky. This movie is your directing debut. How has the transition been thus far from working on screen to working behind the scenes? It's been amazing and I never plan on stopping. I've had a vision for this film from the beginning, and as I continue this process I'm learning more and more to trust my gut and go with it. I've worked on films behind the camera in many capacities, as I've always loved the filmmaking process in general and wanted to be on-set no matter what, always wanting to learn something new, but the transition to writer/director with a vision from the start has been exciting. Working on something for so long and bringing talented, intelligent collaborators on board to push me, challenge me, and help fulfill the vision of this film has been a great experience. I haven't thought of what my next project will be, but I know there will be one. How does it feel to have a legend like Robert Vaughn play your father? It's kind of surreal, to tell you the truth. I remember watching "The Magnificent Seven" with my father, as he was a huge cowboy fan, while I was growing up, and now, to have Robert play a version of my father on screen is amazing. My dad would be so happy and excited. I can't wait to direct him and act alongside him, as our preparation so far together for the film has been thorough. He's asked great questions, and is an intelligent, dedicated actor. What are you most excited about starting filming and what are you most nervous about? I'm just excited to film, first and foremost. This movie means so much more to me than just all the work I've put into it, it's kind of a way of honoring my father, and saying goodbye, almost, accepting the fact that he's gone. I want to give it my all, for him. I'd say it's just general nerves at this point. Not really nervous about anything specific and trying to come up with a plan B, C and D, because as we all know, in filmmaking, plan A sometimes falls through. So I guess it's just about trusting our contingency plan. But overall, I'm so excited to finally be shooting. It's still like I'm walking around in a dream.